When I posted a shot of this roasted cabbage on Instagram a few weeks back, it quickly became one of my most liked photos. Why? I would guess that it’s because people gravitate toward things that are both simple and beautiful—in life, in others, and especially in food. I love that. I get that. 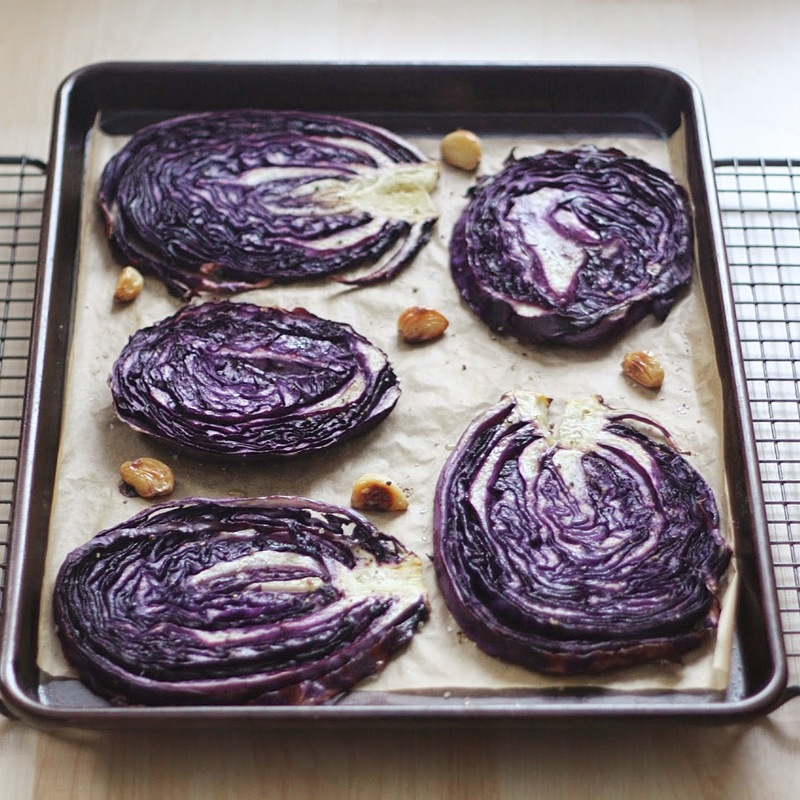 We started roasting cabbage like this last summer, back when our CSA haul featured cabbage almost weekly. Months later, we’re still eating it this way, usually as part of a quick weeknight meal along with some sausage and white beans in olive oil (recipe coming soon). Leftovers always go into my lunches along with some feta or goat cheese. Roasting vegetables is one of my favorite cooking methods. The process is simple yet it results in such full flavors and textures that you really can’t help but love the end result. I understand people not liking steamed vegetables. But roasted ones? Come on. They’re dreamy. 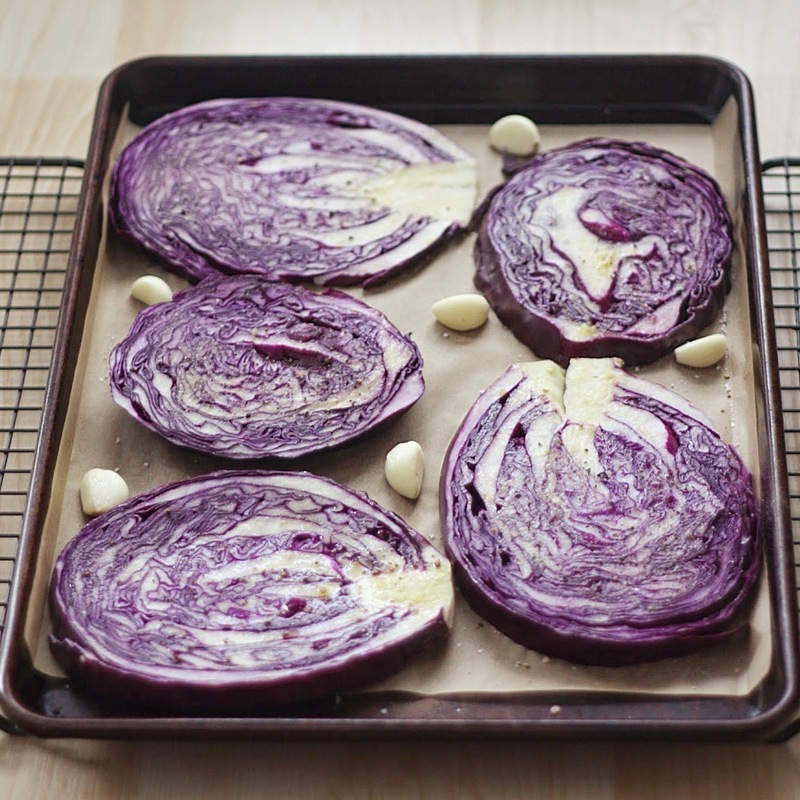 In the case of cabbage, roasting the rounds whole creates an end result so tender that you can even eat the core. The inner ribbons turn silky soft, while the very outer edges char slightly and taste similar to a kale chip, only a million times better. 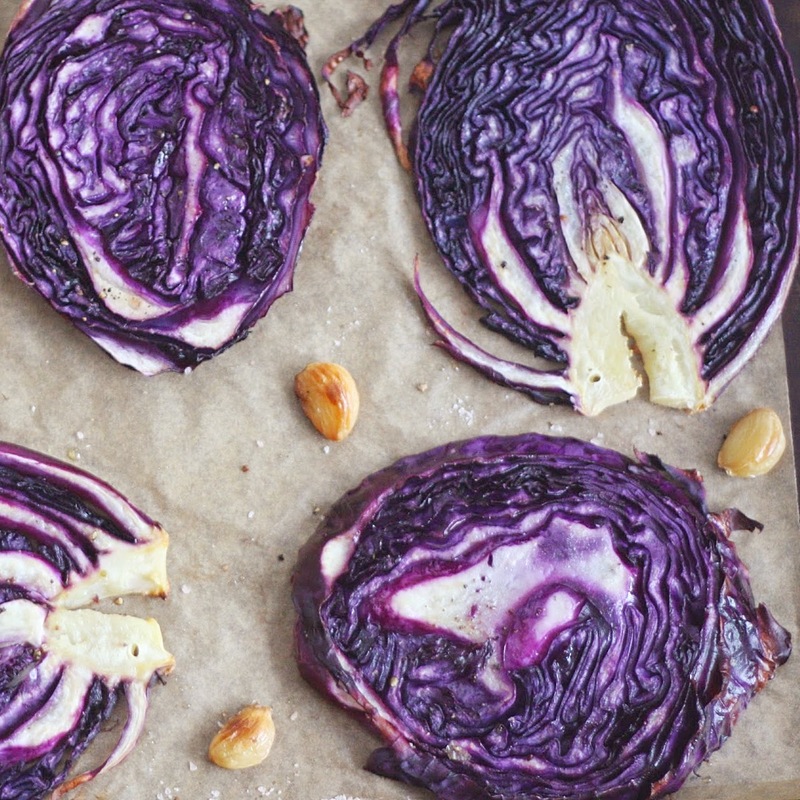 If you never thought cabbage could be addicting, try this and get back to me. Use the biggest, sharpest knife you have for cutting the cabbage and be very careful, as the whole thing can take a little work to cut through. The garlic is optional. You can also sprinkle any dried herbs you like on top, such as oregano, thyme, or whatever goes best with the rest of your meal. I just kept mine simple here. 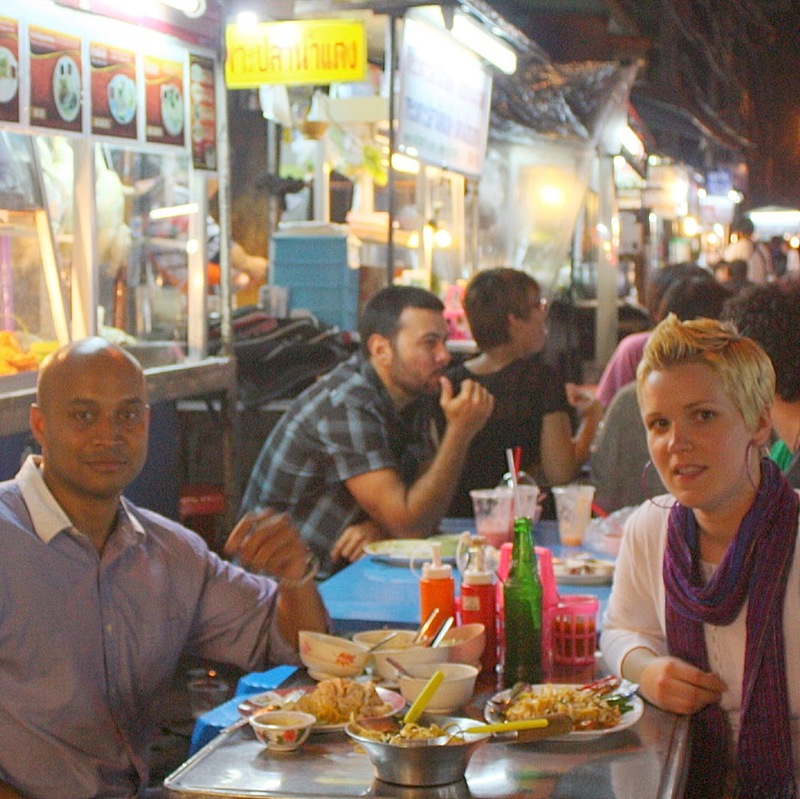 A few weeks ago, one of my closest friends came over for an Indian cooking lesson. We made two things: coconut chutney and this lemon rice. There were very few leftovers. 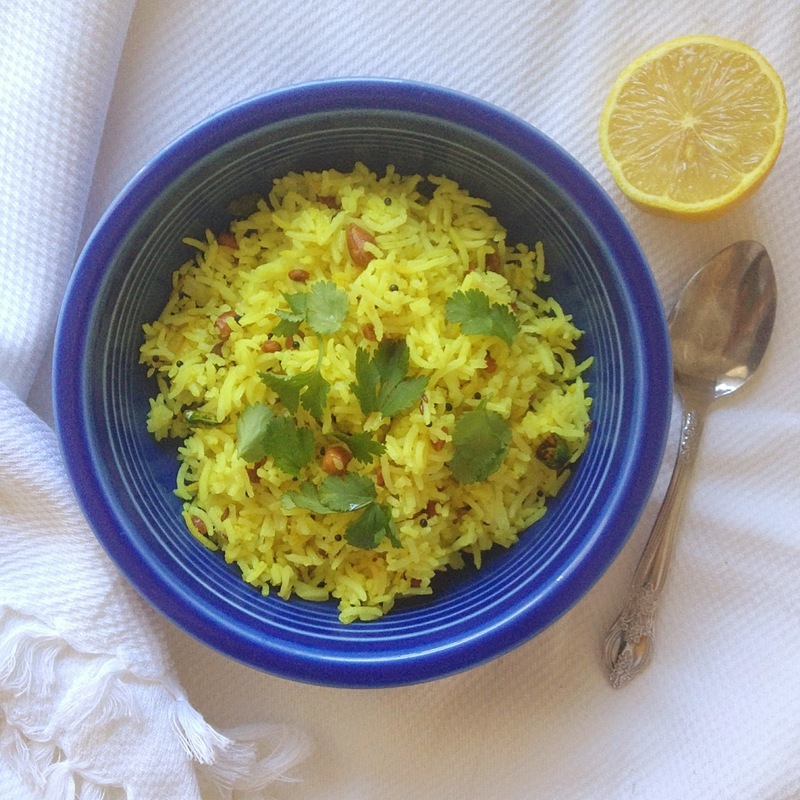 Lemon rice is a simple, home-style, spiced rice dish. It isn’t often found on Indian restaurant menus, but it is a very typical offering at Hindu temples, where food is offered (for free) following most ceremonies. 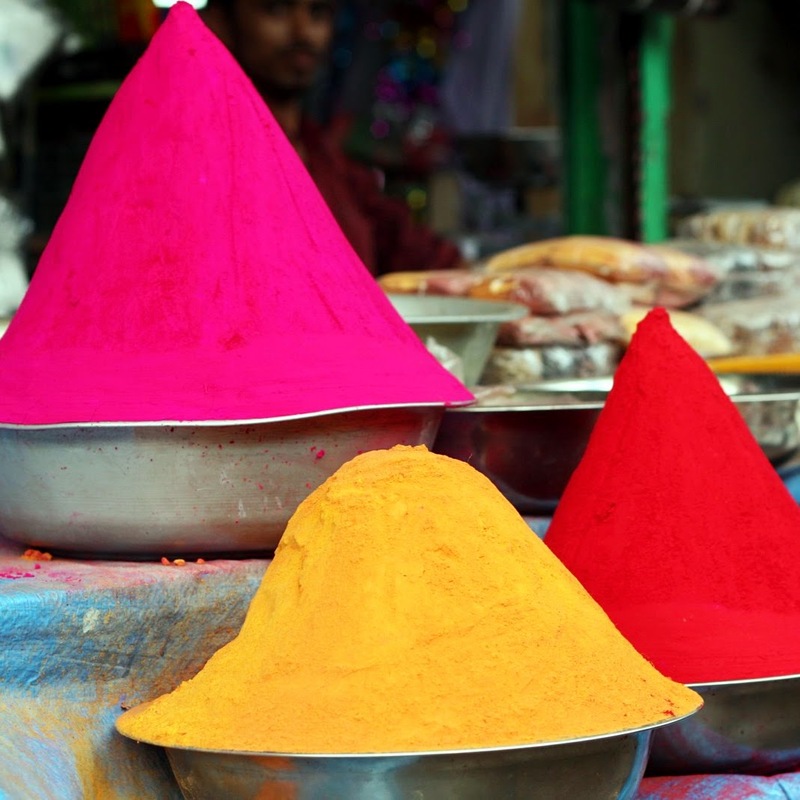 Because it contains no onion or garlic, which are not permitted inside temples, and can easily be made on a large scale (they serve it from enormous steel bowls), it’s a common feature there. I was hooked the first time I tried it—slightly citrusy, with bursts of flavor and spice from the mustard seeds, cumin seeds, and peanuts. It’s a dish that goes well with just about any meal. We sometimes have it as a snack too, alongside strong, Indian-style tea. White basmati is the preferred rice for this dish, as it is for most Indian meals. It has a wonderfully aromatic flavor, takes 10 minutes to cook, is light on the stomach, and is perfectly suited to both Indian and non-Indian meals alike. While I do like brown rice once in awhile, I do not eat it on a regular basis. For one, it contains higher levels of arsenic than white rice (Consumer Reports), and it is also high in phytic acid. What is phytic acid? It’s an anti-nutrient found in the outer bran of brown rice that prevents us from absorbing many of the nutrients found within (white rice has its outer bran removed so while it is slightly more refined, it’s easier to digest). Unless brown rice is soaked or sprouted before cooking, which breaks down that pesky phytic acid barrier, your body can’t get much out of it. Kind of like eating a locked treasure chest full of healthy food, instead of opening it and eating the food itself. So if you’re not going to soak or sprout your brown rice, just go for white and don’t worry about it. If you’ve never had Indian mustard seeds before, I really encourage you to buy a pack and give them a try—they are tiny and black and pop like popcorn when you put them in hot oil. They have a complex, addicting flavor; not so much mustardy as deeply nutty and a little pungent (they are not hot/spicy). Fresh curry leaves can be found at any Indian grocery store. Finally, note that the vibrant color of this dish comes more from the turmeric powder used than the lemon juice. Heat 1 tablespoon of your oil/ghee in a large pan with lid. Once hot, add nuts, lower heat and fry until lightly golden. Remove from oil and set aside. Add remaining oil and heat until very hot (this is essential for getting the mustard seeds to pop—do not use regular butter or an oil like olive oil for this, as it will burn before it gets hot enough). Add the mustard seeds and immediately cover with the lid. The seeds should immediately start popping and spluttering wildly, just like popcorn. Let them do their thing for a minute or so, until the popping dies down, then lower heat to medium. You don’t want it as hot when you add the next ingredients, or they will burn. Add the cumin seeds, curry leaves, and green chili and fry for another minute. The cumin seeds and curry leaves will turn a deeper brown—again, just be careful not to let them burn. Add the turmeric powder and allow it to dissolve into the oil. Add cooked rice and stir to combine. The rice will absorb the tumeric-tinged oil and begin turning a lovely shade of yellow. You can add a pinch more turmeric if you don’t think yours is yellow enough, though give it a few minutes first, as it sometimes take a little time for the full color to come out. If your rice begins sticking to the bottom of the pot, add a bit more oil (or a little water) and lower the heat. 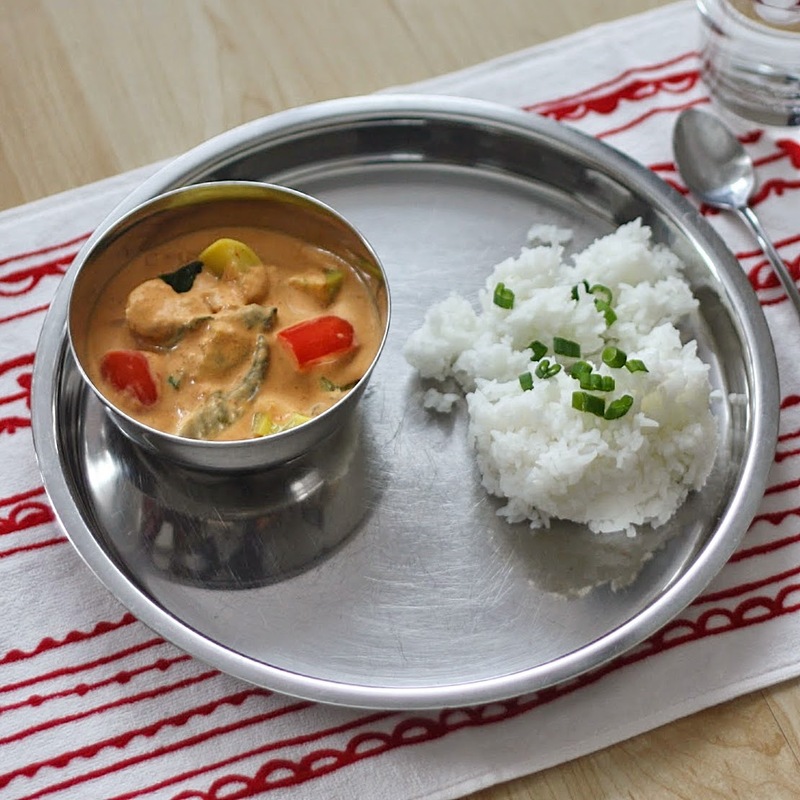 Cook for 5 to 10 minutes, until the rice is hot and the flavors are well absorbed. Add lemon juice, mixing well, then sugar and salt to taste. 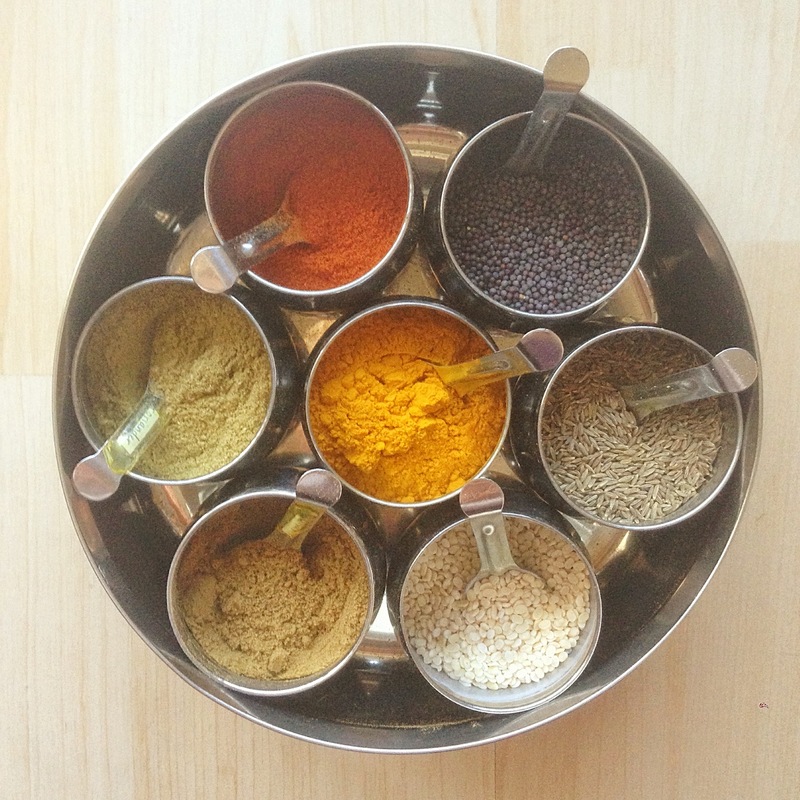 This masala dabba, or spice box, contains our most-utilized Indian spices. Turmeric is front and center, followed by (clockwise, from top left): red chili powder, black mustard seeds, cumin seeds, urad dal (a split lentil used in seasonings), cumin powder, and coriander powder. The dabba comes with a glass cover and lid and makes Indian cooking a breeze as you can access your spices in one go. They’re available online, and at many Indian grocers. I wanted to share with you today what fats and oils I use in my kitchen on a daily basis. This seems to be a confusing area for a lot of people (it definitely was for me when I first started cooking). As with most else, I favor the most traditional and pure choices I can find. For me, these are coconut oil, olive oil, almond oil, and butter/ghee. From their names alone, you know their source, which already says something, doesn’t it? Why no canola oil, no vegetable oil, no sunflower/safflower oil? Because these are highly refined oils that are nowhere near healthy choices. In brief, refined oils are made by highly intensive mechanical and chemical processes that extract the oil from the seeds. The oil is then heated until it goes rancid, then oxidized/deodorized to remove any off-scents. The oxidation factor makes these oils more likely to break down into those nasty things known as free radicals, which wreak havoc on our bodies and health. I’ll pass. Coconut oil. Great for higher heat cooking (like shallow-frying) and roasting vegetables. 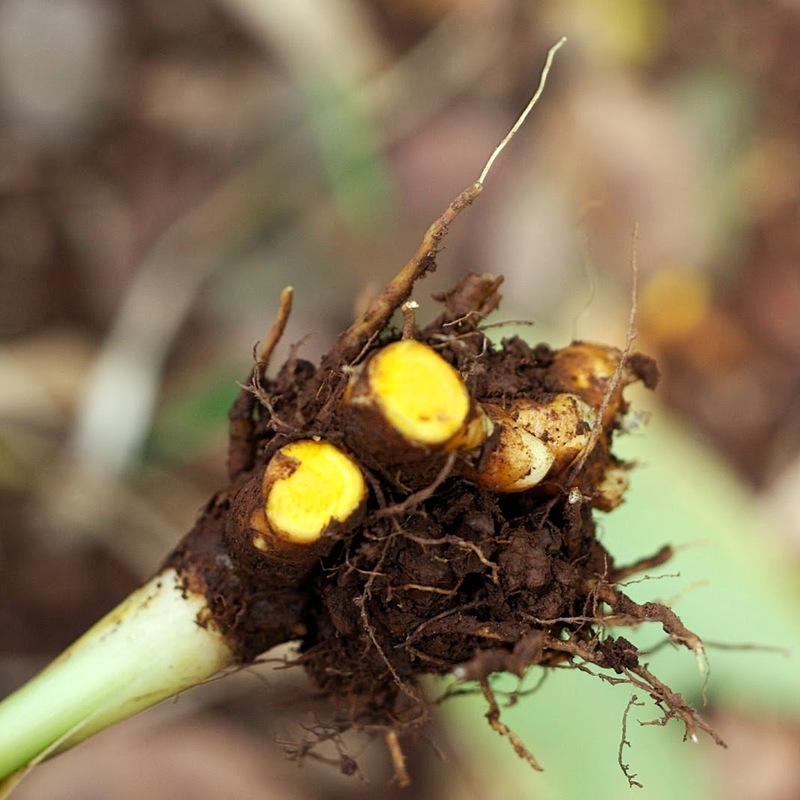 The oil itself has antifungal and antimicrobial properties; is uniquely high in medium chain trigylcerides (MCTs), which contribute to brain health; and has been used by traditional, tropical cultures for centuries. It has a slight coconut flavor, so I often use half coconut oil and half butter or ghee when cooking. I also like to use it in baking (like in these cookies). Brand-wise, I either order through the online company Tropical Traditions, or just go with Whole Foods’ 365 brand. Almond oil. This oil has a very neutral flavor and is great for high-heat cooking, which is what a lot of Indian dishes require (its smoke point, or the highest heat it can sustain without burning, is 420 degrees F). It’s also high in healthy monounsaturated fats. I think this is one of those oils that will only grow in popularity as more people learn about it. [Interestingly, Indians also use it as an all-natural hair and skin moisturizer.] We buy it from the Indian grocery store for about $10/bottle, so it’s similar in price to olive oil. Olive oil. This is one that will always be one of my favorites. We all know good olive oil is for us; like almond oil, it’s high in monounsaturated fat, which can help reduce the risk of heart disease and stroke. I like to use it for lighter applications that require no or little heating, such as in salad dressings, as a dip for bread, or for light sauteing. I always look for extra-virgin, cold-pressed when I can find it. For the past year or so, we’ve been ordering direct from a family-run farm in California (Chaffin Family Orchards). Their olive oil is 100% cold pressed and extra virgin, and it’s the best olive oil I’ve ever had. We actually bought 10 gallons this year to split with family and friends. Our gallons arrive in March, so in the meantime, we use the brand pictured below, which has been reviewed as one of the best-tasting, most affordable store-bought choices (Real Simple magazine). Butter. I’ve always been on Team Butter (heck, one my favorite books to edit was called Back to Butter—I highly recommend it). Butter, grassfed especially, is rich in vitamins A, E, and K2. It is a healthy saturated fat in moderation. I use it mostly for making eggs and for toast, of course. I like Kerrygold brand, which is grassfed and rich in both flavor and color (and those aforementioned vitamins). 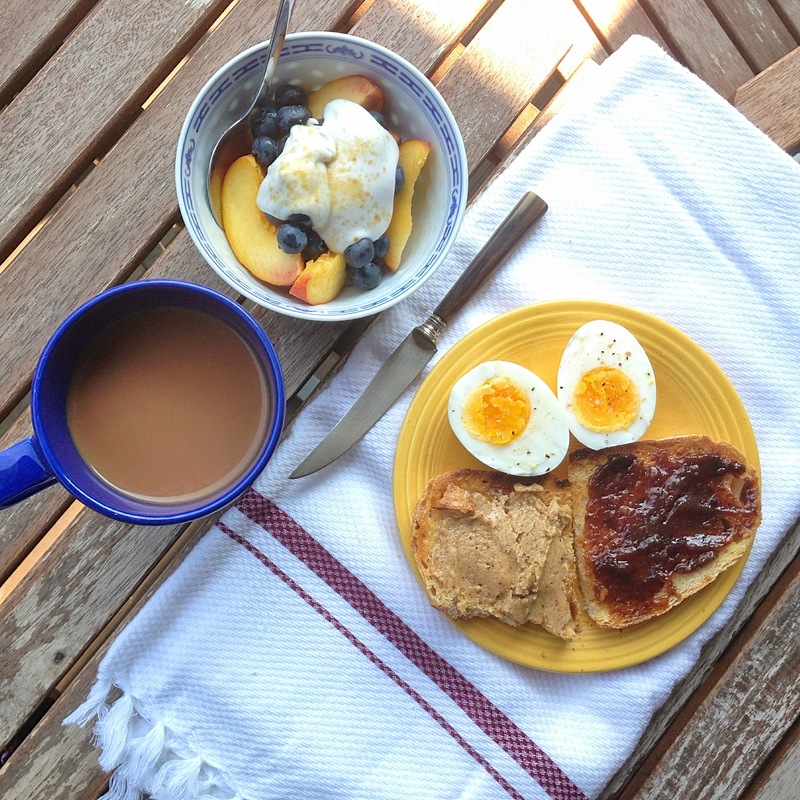 I also like Trader Joe’s organic butter, which is what I use in the recipe for ghee below. Ghee. 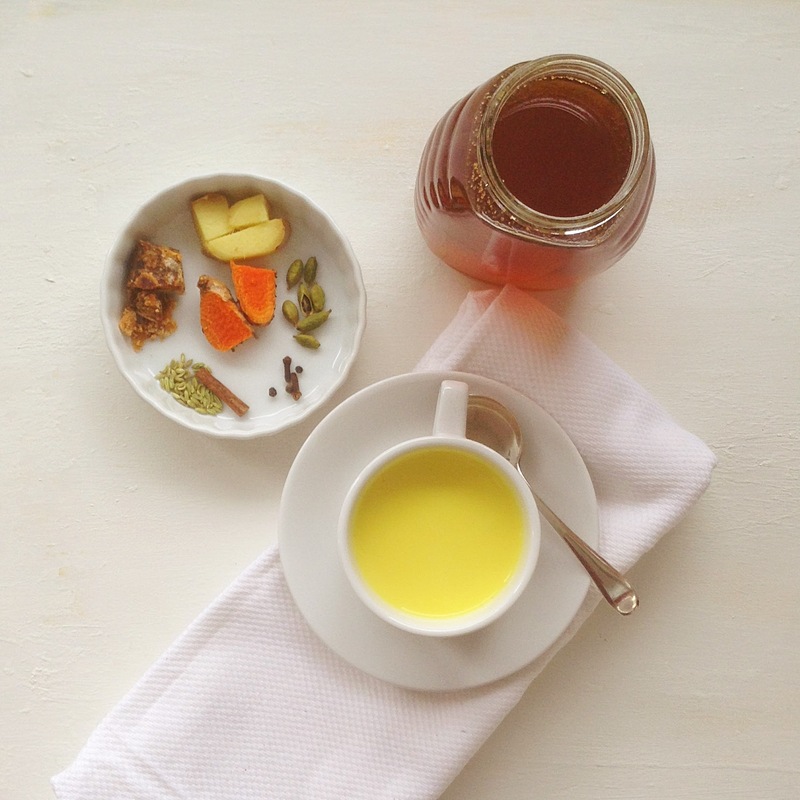 Ghee is butter that has been cooked down to remove all of its milk solids, lactose, and proteins. This process raises the overall smoke point, meaning that you can cook with ghee at a higher temperature than you can with butter, without it burning. 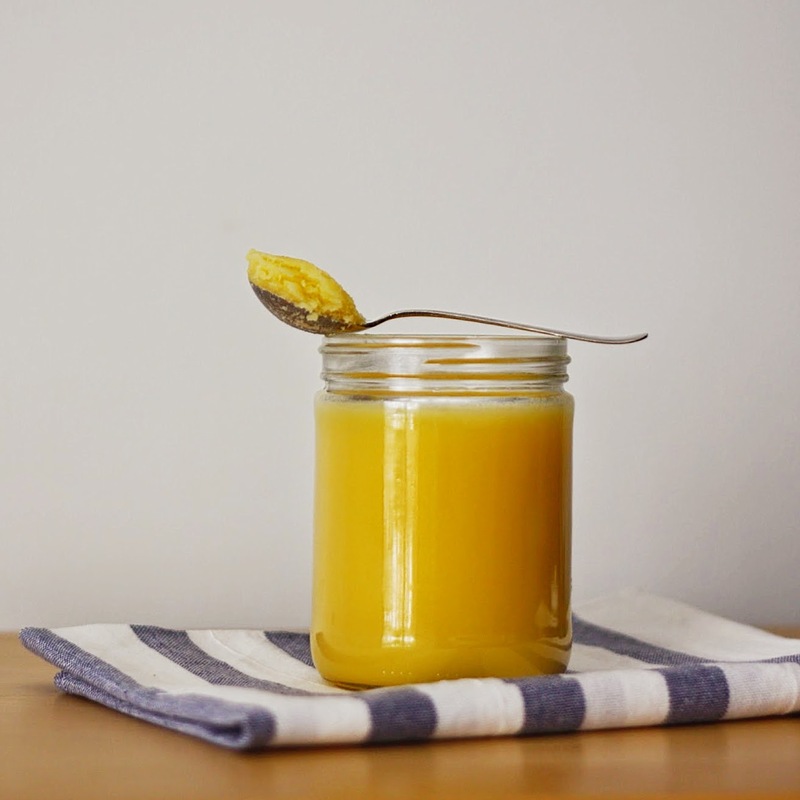 Ghee is also easier to digest—many people with dairy allergies can even tolerate it—and it is more concentrated in nutrients than regular butter. Ghee is a traditional cooking fat; it’s a staple of Indian cooking. We use it there, as well as for pan-frying fish and meat, and sauteing and roasting vegetables. We also eat it on its own, alongside Indian flatbreads like paratha. There’s really no place it doesn’t belong. The taste is phenomenal. Like concentrated butter with a hint of nuttiness. I’ve used all sorts of butter to make ghee, and both unsalted and salted varieties, but my very favorite is Trader Joe’s brand organic salted butter. It makes the most beautiful ghee (pictured above) and tastes so.damn.good. Salted butter, for me at least, seems to froth up a bit less when cooking down and I think it brings out the flavor of the ghee more. Either salted or unsalted, in any brand, will work though. Place butter in a saucepan over low to medium heat. Cook for 20 to 30 minutes, reducing the heat as needed. During this time, the butter will be simmering and bubbling gently, and may pop occasionally. It will foam up at first as well, which you can scrap off and discard, or just leave it until it cooks off. You can tell the ghee is done in a few different ways—it will begin to smell wonderfully nutty; it will turn golden in color, with perhaps a few brown bits at the bottom; and the burbling will have quieted down to just an occasional pop/sizzle here and there. Keep in mind that you don’t want browned butter, however, so don’t let it go too far. Let cool then strain into a jar through a very fine-mesh strainer or a larger strainer lined with a piece of cheese cloth. You don’t want any foam or other bits to get through or they will burn when you go to heat the ghee for cooking (these bits lower its smoke point), so strain carefully. The ghee will solidify as it cools. Store in the fridge or cupboard. If you follow me on Instagram, you might notice that eggs are sort of my where’s waldo food. They appear in countless photos. I love them. A lot. I eat one hardboiled egg as part of almost every weekday breakfast, and usually pack one to go with lunch as well, whether that’s in a big salad or alongside some cooked grains and roasted veggies. If I’m working from home, I’ll throw a fried egg on top of my rice bowl. On the weekends, we brunch on Indian-style omelets spiked with cilantro, green chilies, tomato, and red onion. We buy our eggs from a local farmer couple named Wes & Lou. They keep two coolers full of eggs outside their house, along with whatever else they have in season, and you pay based on the honor system. Usually there’s a chicken or two clucking around you while you scrounge up your cash (free range is an understatement here). Wes and Lou’s eggs are phenomenal. The yolks are always a rich yellow-orange hue and they taste both fresh and natural, as eggs should. Some are huge and have a double-yolk, others are small and smudged. No two are alike. That’s the beauty of it. We think they taste better than grocery store eggs—even the “organic” ones (which can sometimes have a “fishy” taste due to the amount of omega-3s they pump into the chickens and sing about on the label). They cost less than those store-bought organic eggs, too. 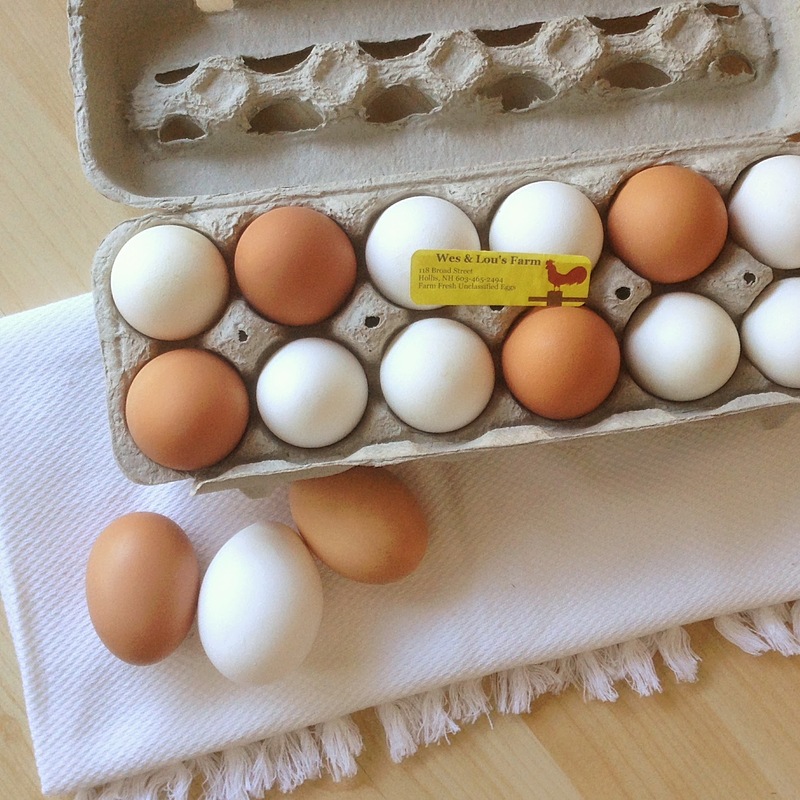 We pay $2.50/dozen for medium-ish eggs and $3.50/dozen for large-to-enormous ones. The hens are pasture-raised, meaning they are treated kindly, eat bugs and grass, and roam freely. All of these conditions directly factor back into reason #1. Pastured eggs are much more nutritious than typical supermarket eggs, with 4 to 6 times as much vitamin D, 1/3 less cholesterol, 1⁄4 less saturated fat, 2⁄3 more vitamin A, 2 times more omega-3 fatty acids, 3 times more vitamin E, and 7 times more beta carotene (Mother Earth News). We like to support local agriculture. When I first started buying and hard-boiling farm-fresh eggs, I would curse at myself every.single.time I went to peel them (the fresher an egg is, the harder it can be to peel). I’d lose half the white to the shell and have tiny shell pieces everywhere. Then I read an article on Serious Eats about an easy way to boil eggs so that they peel without a problem. Instead of putting the eggs and water in a pot and bringing it all to a boil, you first boil the water and then add the eggs. Sounds ridiculously simple, I realize, but it has been completely revolutionary for me. I’ve probably boiled at least 100 eggs like this by now, and not a single one has stuck to the shell. The yolks also stay beautifully colored, and perfectly cooked (I like them tender, not chalky). If you know someone who has chickens, or can find a local source, I don’t think you’ll regret picking up a dozen. Boil a couple off, toss them in the fridge, and hit ’em up all week long. I’ve yet to find a meal they don’t go with. Take eggs straight from the fridge and carefully lower them into the pot with a spoon, taking care not to break them. Lower heat to a low boil (this is a 6/10 on my burner) and set your timer for 10 minutes. Adjust the heat as needed while the eggs cook—it should be at constant simmer/low boil, meaning bubbles are constantly rising to the surface, but not so aggressively that they’re knocking the eggs around. After 10 minutes, remove eggs and place in a bowl of ice water. Allow to cool for at least 15 minutes; if you want to eat them warm, just chill for 2 to 3 minutes instead. Store in the refrigerator for up to 5 days. Sprinkle with good salt (I use Himalyan pink) and freshly ground pepper. 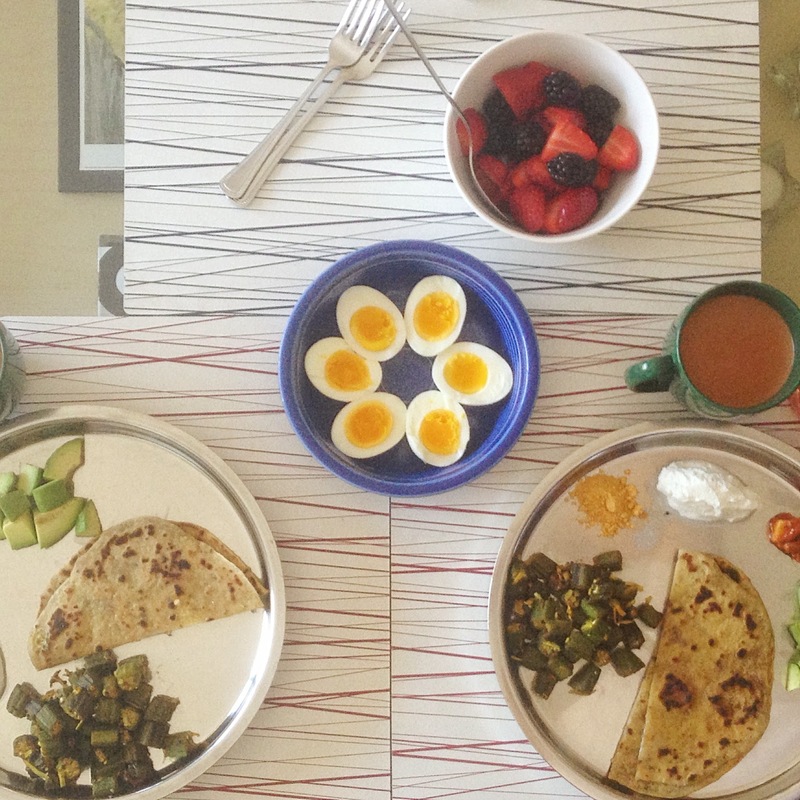 Eggs alongside an Indian breakfast of okra and paratha (whole-wheat flatbread).